We also sell hand made furniture. Using old growth timber, and working the wood to leave original saw marks and blemishes. Producing high quality indoor and outdoor pieces. 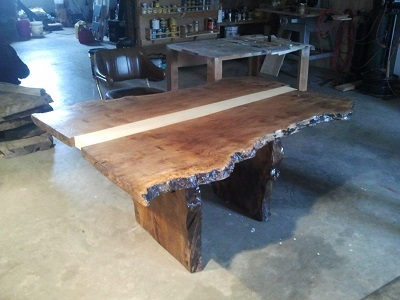 From dining room tables, benches, pub tables, or eclectic pieces, we strive to make your vision into a beautiful/useful piece to last for years and years. Because of storage space our inventory is usually small, and pieces are built upon order. If travel is an option, then we'd be glad to have you stop by and select the wood for your original piece. Some examples are shown below, look them over to see if anything suits your fancy. Not all pieces shown are available.